Wednesday June 27th 1900 There was some rain this morning the boys went out to plow about nine oclock. I was busy with the chickens a great part of the time when not busy with the work. Weather a little pleasanter. Thursday June 28th 1900 Will went after Prish early this morning. She churned and washed while I got the dinner. I took Ossie Spencer with me and we went out to Mrs Emorys to a lawn party. We had such a pleasant time and did not get home till just night. Prish had the work all done up and Mort took her home. 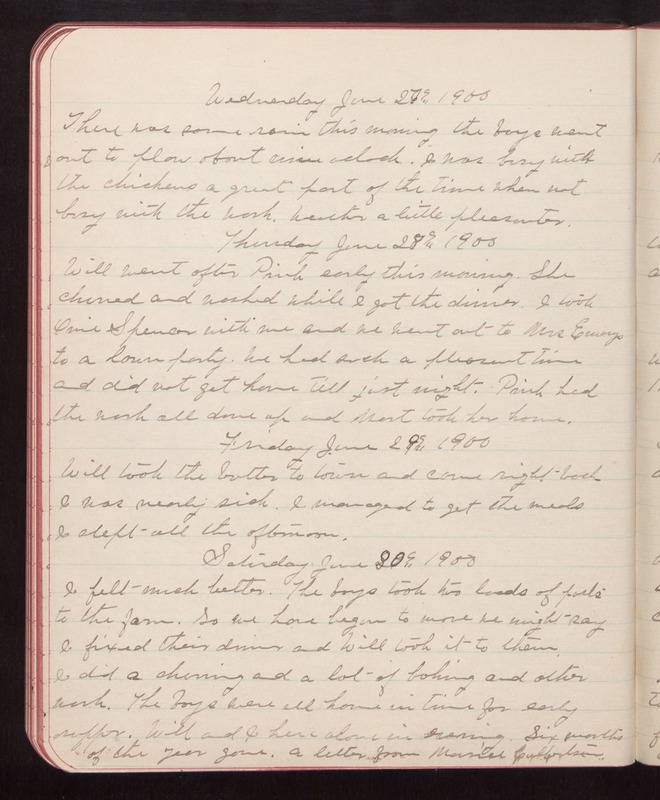 Friday June 29th 1900 Will took the butter to town and came right back I was nearly sick. I managed to get the meals I slept all the afternoon. Saturday June 30th 1900 I felt much better. The boys took two loads of posts to the farm. So we have begun to move we might say I fixed their dinner and Will took it to them. I did a churning and a lot of baking and other work. The boys were all home in time for early supper. Will and I here alone in evening. Six months of the year gone. A letter from Maurice [Culbertson].